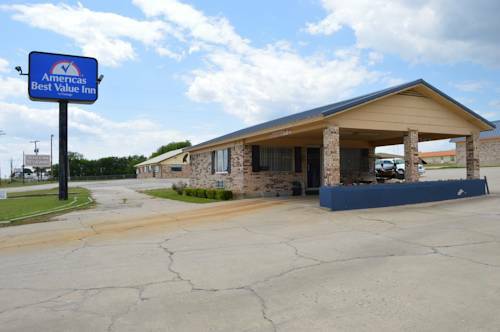 The Americas Best Value Inn/ in Gainesville/ Texas/ is conveniently located on Highway 82 East. Our charming and affordable facility offers 15 spacious guest rooms. We are close to restaurants/ businesses/ and local landmarks. All our guest rooms are furnished with high-speed Internet access/ microwave/ mini-fridge/ and cable TV with HBO. Local calls are complimentary. We also have a guest laundromat/ and guest fax and copy facilities. Pets are allowed/charges and restrictions apply We start your day right with a fresh complimentary continental breakfast/ and we have a courteous and experienced staff which will be happy to assist you during your stay. Americas Best Value Inn is located off Highway 82 East- 3 miles from I-35 at exit 498A. Our address is 3019 Highway 82 East- Gainesville- TX 76240. Named after Texas billionaire H. Ross Perot, the off-kilter cube features an earthquake simulator, sliced human cadavers, and everything you ever wanted to know about fracking. At night: the big frogs outside glow an eerie green.